The Colorado Department of Revenue's Marijuana Enforcement Division licenses and regulates Marijuana Businesses in the state of Colorado. In order to be eligible to apply for a Marijuana Business License you must meet certain statutory requirements including being at least 21 years of age or older and a resident of the state of Colorado. Additionally, you must confirm that the city and county where you plan to operate your business allow Marijuana Businesses to operate within their jurisdiction. Anyone working within Colorado's marijuana industries (Medical or Retail) must also obtain a Marijuana Occupational License. These application and licensing fees can range from anywhere from $3,000 to over $13,000. If you are an existing Medical Marijuana Center, converting to Retail may be easier whereas new applicants may be subject to a waiting list. In order to have the best chance of obtaining a license, prospective businesses should begin the application process as soon as possible. Licenselogix can help with all city, county and state license filings and registrations. 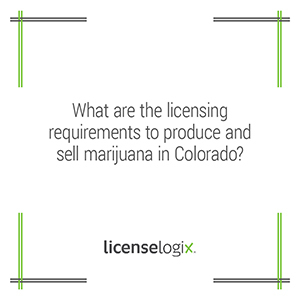 Licenselogix will ensure that your Marijuana Business is compliant will all license requirements and renewal dates. Our ongoing compliance service (CLiC) can help you keep all your licenses organized, safe, and accessible in our online database. Get started today by requesting a quote or calling us at (800) 292-0909.